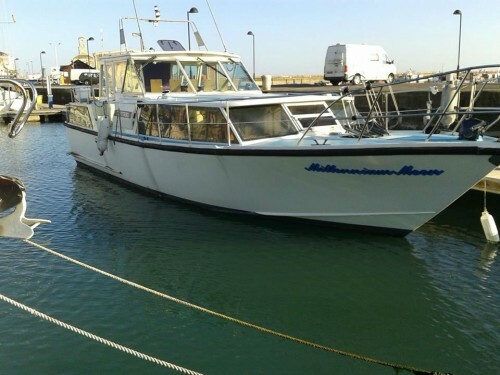 Accommodation and Below Deck: 6 Berths, 3 Cabins, 2 heads with sea toilets and shower, stereo, holding tank, gas cooker with grill and oven, galley sink, fridge, pressurised hot water system. Engine (s) and Electrical: 2 x Perkins T6354, 145hp diesels. Drive type: shaft with 4-blade bronze propellers. Last serviced: 2012. 8 batteries charged from the engines. Shore Power. Battery charger. Deck and Canvas: 10kg bruce anchor, anchor windlass, stanchions, guardwires, boarding ladder, pushpit, pulpit, boathook, 2 gas bottle lockers, dodgers. Navigation and Safety: GPS, VHF, navigation lights, clock, barometer, lifebouy, 2 lifejackets, foghorn, radar reflector, fire extinguisher, gas detector. Last Survey July 2010. 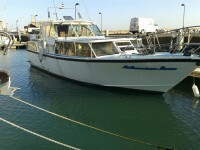 A comfortable 6 berth cruiser with a central wheelhouse leading to a separate aft cabin with a double berth and head to port. 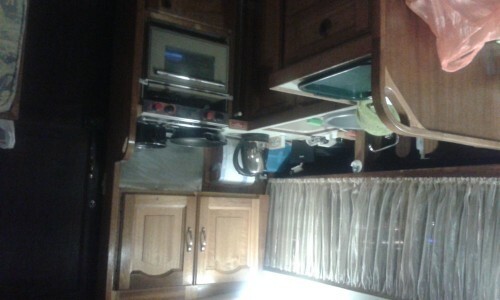 forward of the wheelhouse is the galley with a separate head opposite to port. forward of these is a dinette area and in the forepeak another large cabin with conventional V berths. © 2019 We Sell Boats. All Rights Reserved.